Once I had installed Sierra on my MacBook Pro, I immediately took to using Siri within the first few days. Unfortunately, that wore off quickly as engaging the keyboard shortcut didn’t feel as nice as just being able to say “Hey Siri”. Logically, I’m not sure why Apple didn’t implement vocal activation for the assistant on the Mac. In the grand scheme of things, most Macs pack a hefty battery (much larger in capacity than a mobile device) or a continuous power source. Why they would lack voice activation astounds me. There would be opportunity for a potential decry from the public if they understood their computer’s microphone were always on, but that’s already the case with iPhones and iPads. Regardless of this, I wanted to be able to launch Siri using just my voice. I felt it would be a good test to see how much more often I would interact with Siri. I nearly forgot about looking for a creative way to launch Siri by voice until I stumbled across a Reddit thread today by user Jdcampbell. 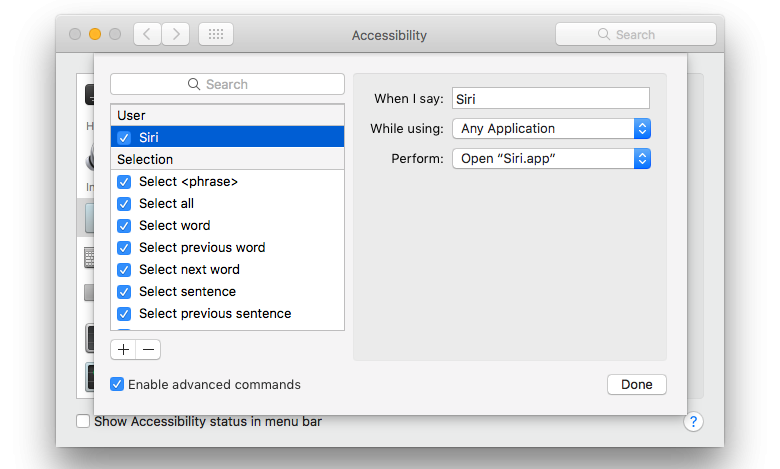 In the thread, Jdcampbell explains a creative way to get Siri to launch by using the Accessibility Dictation feature. In doing so, I would no longer have to readjust my muscle memory while typing, I could just say it aloud. I’ve been using it for the past few days, and it has been working out surprisingly well. 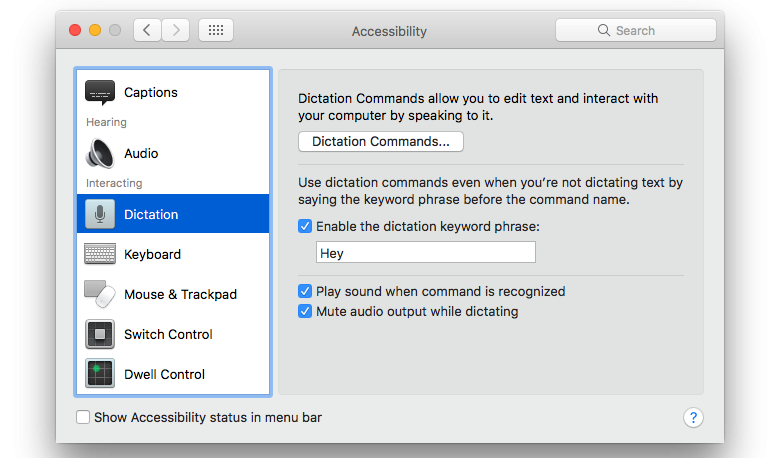 Note: Adding ‘Hey’ into the dictation keyword phrase field is what initiates the Dictation tool to begin listening to a future command. Adding ‘Siri’ to the When I say field links that as a command to be followed by the Dictation tool. If you find yourself accidentally activating other Hey Siri devices nearby, you could try switching the commands around to something like “Okay Siri” or “Hello Siri.” If after enabling everything you find it’s not working, try disabling Siri and the dictation keyword phrase, and then reenabling them. As we’re only on beta 2 of Sierra at this point, the possibilities of introducing Hey Siri functionality are not farfetched. Using this small trick could fill that void until it becomes a reality. Credit goes to Jdcampbell for the original instructions, and to pchalla90 for the suggestion of pointing directly to the Siri.app.